It is always an uplifting pleasure to spend time with the Ghetto Classics kids at Korogocho and to see their dreams that they hold for themselves, their siblings and the area as a whole. How they always all want to make it in life and come back and change the place. Last Sunday was one such one afternoon that I spent with them in between their practice of assorted musical instruments and although I did not speak to all of them, I’ve spoken to enough of them over time to know that the common thread among them is to become full time musicians, part time musicians, excel in their studies and change their communities for the better. The discipline of music changes their mindsets and it is always so powerful to be among such beaming hopes on the verge of rising from adversity. To be among youngsters who were to some degree hitherto staring at futures of doom and gloom, only to be uplifted to heights they never imagined. And how they embrace this opportunity always challenges me. Ghetto classics is where all proceeds of the increasingly popular Safaricom Jazz go. 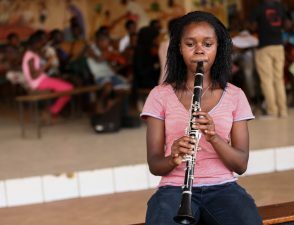 One young lady I met that Sunday at Korogocho is Lewinsky Atieno, who plays Clarinet and who joined Ghetto Classics in 2014. Lewinsky is 19 years old and has no doubt in her mind that she wants to pursue music and music only as a career. She’ll be joining Kenyatta University next year to study the same and she prays that the fees will be available to see her through the whole way. Although she’ll have to start at certificate level, onto diploma and further, she’ll be going to KU with the distinct advantage of the music background that she has gained at Ghetto Classics. She’s also among the kids who went to Poland courtesy of the Brave Festival and Jimek who came and around and like many other international stars, fell in love with the idea and the execution that is Ghetto Classics, and decided to take an active part in helping. The Poland visit and practicing with professionals was an eye opener beyond her wildest dreams. Having grown up in the not so favorable Kariobangi area and schooled in Our Lady of Fatima in the neighborhood, flying out was not anywhere in her radar – let alone in her wildest dreams. It was also quite a catalyst for her to build bigger dreams. Lewinsky feels very comfortable at Ghetto Classics and while she used to manage just 2 weekdays plus weekends while she was still in school, now she comes every day. Although she has blood brothers and sisters, she also feels a strong sense of family at Ghetto Classics and one thing she kept insisting is that no matter how far she manages to go, she’s never forgetting this as her home. Seated across the young lady, I could not help feeling that I was in the presence of a star in the making. I wish her and her family all the very best. On the same day I spoke to a young man by the name Stephen Ongoma aged 18 and who is a student at Our Lady of Fatima. 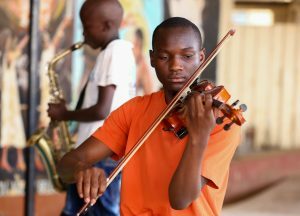 He’s in form 3 and is therefore clearing fourth form next year, after which he plans to continue excelling in his instrument of choice and expertise – the violin, as well as International Relations. Wherever his dreams take him, his one wish before anything else is to get his hard working mother out of Kariobangi where they live. The mum is a casual worker in Lakisama and as much as food is always available, rent is debatable. Availability of work for her is a hit or miss and this is something he wishes to correct by helping her set up a good business in future. His older sister dropped out of school and later studied beauty and he has dreams of also helping her grow by buying her equipment to excel in her business. She has a young baby with a good guy from the neighborhood. Before joining high school and Ghetto Classics, Stephen was in a missionary primary school with among other things, a feeding program and this paved the way for him to ace his studies and dreams. Stephen is also among the kids who traveled to Poland and one thing that struck him is the focus and clarity with which identifying, picking a line of work and giving it one’s all at a young age is quite a thing in that country. Laser focus if you may. He was quite fascinated by the history, infrastructure and technological development there and I got the feeling that maybe that’s why he wants to pursue International Relations. He knows that he’ll get out of Korogocho, but he also plans to will come back to invest in terms of knowledge and whatever else he can in the area and of course Ghetto Classics. These are just two examples of what the community program that is Ghetto classics does to kids and young adults in Korogocho and even though not everyone in the area has joined, what has been done is a clear example that they’re not born wanting to be criminals and drug addicts as one would imagine of informal areas. Given a chance they do want to excel in other fields just like other people and Safaricom Jazz is certainly to thank for uplifting their dreams and livelihoods.